I didn't have time to do a blog yesterday (we were baby sitting), so here you have yesterday's news and pictures. 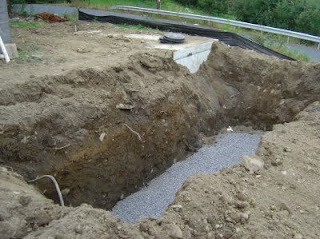 Nick, our super duper pooper scooper septic system excavooter, hooked us up to the new septic tank. Given the size of the tank (at our current rate of water usage it will take us three months to fill it up) it doesn't matter that it isn't connected to a leach field yet. 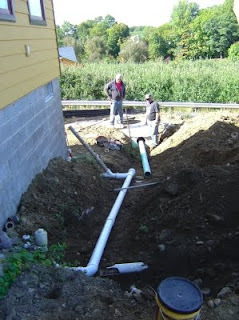 Plus, we're slated to get the pump chamber on Tuesday, baring any more rain. Nick already excavated the hole for it, another big one. 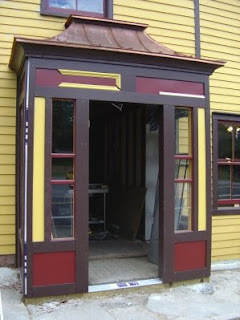 We installed the panels on the front entrance yesterday. Now it looks like Mondrian painting, because the molding around the red panels is still missing. We're not yet decided on the size and color.